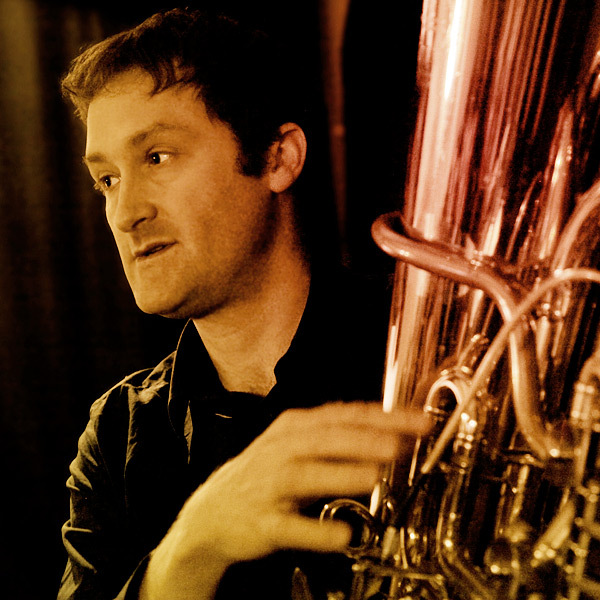 The Berlin-based tuba player, composer, and improviser Robin Hayward developed the first fully microtonal tuba in 2009, which he wil bring with him to Montreal for a performance of his composition Grave Mountain Diagram with his microtonal brass trio Zinc + Copper Works. Isak Goldschneider of Innovations en concert met with him to discuss his upcoming concert. How would you describe the relationship between improvisation and composition in your work? That depends. I’ve done pieces which are completely through-composed, and work which is at least un-notated, so you could call it improvised. But I’ve done other pieces more recently where I think, for the first time, that I’m really integrating both. What has interested me in the last few years is finding a way in which the underlying logic of the piece includes spontaneity. For example, I wrote a piece last year for a group I play in called Reidemeister Move (we hope to be playing in Canada next year) where the logic of the piece demands that we make decisions in real time. I’m interested in something where there are clear rules regarding decisions to play which note and when, but the decisions are integrated into the musical language. It’s like a board game, where one player’s moves may depend on another player’s moves and vice versa, and are governed by the rules of the game. The piece that we’re playing in Canada [on December 12], Grave Mountain Diagram, is completely through-composed, however. If I understand correctly, this piece was based on the work of a 16th-century linguist from Brabant, Jan van Gorp who, it seems, was a rather eccentric character whose ideas contributed to the foundations of modern historical linguistics. What does the title, Grave Mountain Diagram, refer to? Grave Mountain Diagram refers to two words which van Gorp believed lay behind all human language. By the way, he wouldn’t have seen himself as eccentric at all- he was physician to the Prince in Antwerp, and retired from worldly life to concentrate on scholarly life [van Gorp, also known as Johannes Goropius Becanus, theorized that Antwerpian Flemish was the original language spoken in Paradise]. Even at the time, he wasn’t universally ridiculed. The very first Dutch dictionary, published in the late 16th century, notes in its introduction that now that Dr. Goropius Becanus had established that Dutch was the original language, its preservation was all the more vital. What I found interesting was the rationality of his attempt. Though it’s based on false premises, you only have to accept a couple of premises and the whole thing makes a lot of sense. He argued that the very first language spoken in Paradise between God and Adam must have also been the simplest language. So he argued that this language must have consisted only of single-syllable words. Then he noticed that his dialect of Flemish had higher proportion of single-syllable words than Latin or Greek. He concluded that these languages came later, and that he was able to deduce what these original words would have been. So to explain about Grave Mountain Diagram — one of the words that he thought was original was graab [grave]. He also had this idea that palindromes of words reversed their sematic meaning, so the word baarg [mountain] was an original syllable and the opposite of graab. So he made a list of these original syllables with their retrogrades, such as stur [disturb] and rust [rest]. I found these ideas very musical, because they concern structural elements. The structural ideas I drew on came from the idea that each word has an original syllable. So in the piece, short structual forms hocket with material from the other players to produce “words”. On top of this, I use thirteen “original syllables”. The reason for this is that I’m going up to the prime number thirteen; there are seven sections in the piece, each based on a prime number. At the same time the players imitate the sound of these syllables, never actually using our voice; instead we use the instruments as if they were voices, using different brass sounds to imitate vowels and consonants. Zinc & Copper Works is a microtonal brass trio, and you use instruments that were specially constructed for this purpose. Does this influence how the structures you’ve described are expressed in Grave Mountain Diagram? Not really, because I wrote the piece in 2008, and didn’t get the fully microtonal instruments until 2009. In any case, we were certainly exploring microtonality with traditional instruments before, as well as noise and other elements — it’s not just about microtonality. So this technological research really came forth out of a conceptual necessity.